Take Assamese folks out of Assam and you will find Bihu wherever they go. Bihu is not restricted within the realms Assam in India. 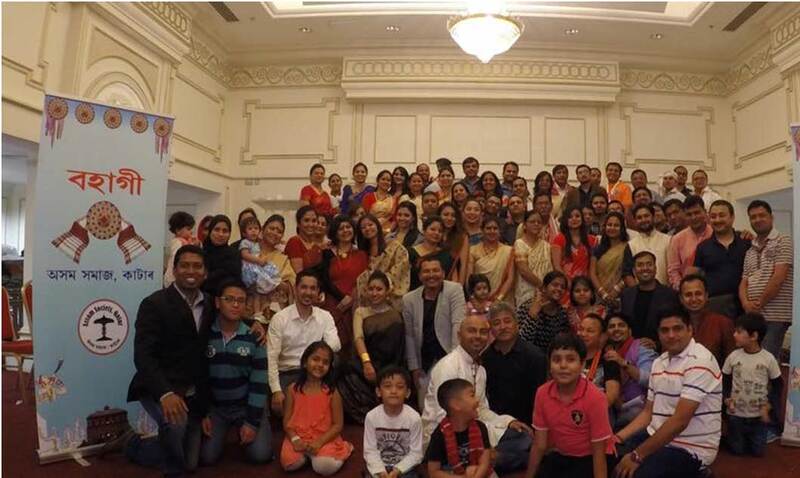 It is celebrated wherever you find an “Oxomiya” (Assamese)—whether on the home soil or any other part of the globe. In fact, people who live outside the state or the country feel the need to stick to their traditions and festivals more than those who stay back and experience it as a norm. Call it a need to identify themselves as natives or to teach their young generation a thing or two about sticking to traditions. They take it upon themselves to celebrate this or any other festival, as a serious responsibility and an occasion to get together with fellow “same-language speaking” people on foreign soils. 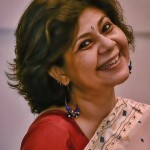 On retrospection, the reason could be them missing the special “feel” this season or festival brings with it, missing their near and dear ones back home, the blooming of the kopou, the melodious tunes of the baanhi, pepa, dhol and gogona (which they would refer to as cacophony over the seven days of the fest if they were home) or it could be plain old nostalgia playing up ! 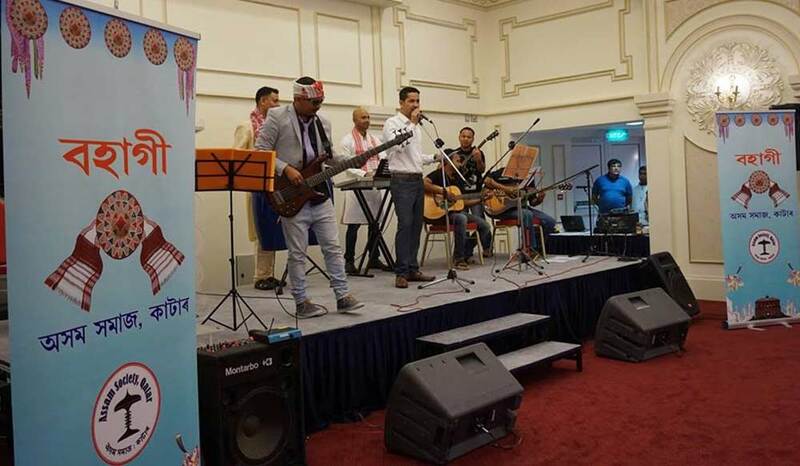 Never having been away from Assam in the last few years during Bihu, I happened to get a taste of that “nostalgia” far away in the sands among fellow Assamese in Doha, State of Qatar. The fear of missing out on all the Bihu fun involving family and friends,quietly crept up on me. It is so true about what they say, “you have to lose something to know its worth”. I sadly conceded with the fact that this Bihu would be uneventful. However, I could not have been more wrong about this! 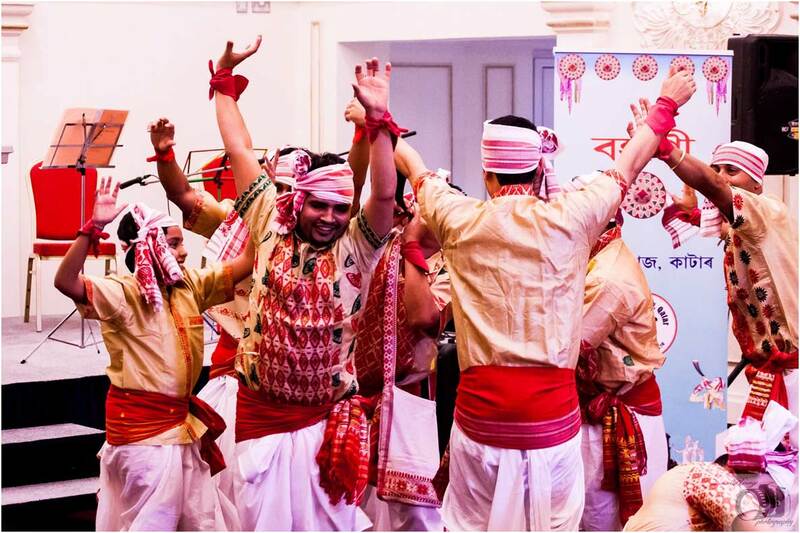 Thanks to the Qatar Assamese Society, this Bihu transpired to be the most enjoyable one in years!! And it would be pertinent to make a point here that the “Oxomiya” in Doha is a friendly, warm and caring soul whose hospitality is something which makes you take to them immediately. My relocation has been easy with these wonderfully helpful and genuinely caring people. So, how do the 100+ Assamese people living in Doha, a home away from home, all busy with their respective professions, celebrate Bihu? Ask the enthusiastic member of the Qatar Assamese Society! This community shares bonds stronger than that of a close-knit family bound by love, respect and brotherhood. That feeling of loneliness that gnaws at the heart, making you long for home is not allowed to surface. You may have countless friends at home or around the globe, but you need that one group you “go home” to in a foreign land that resonates your sentiments of likes and dislikes. The Rongali Bihu in April marks the beginning of a New Year, according to the Hindu calendar. It is also referred to as Bohag Bihu, as April denotes the onset of the Bohag season or Spring, and is celebrated to usher in the season. In today’s world, man has made a major transition from farming to a modern-city-living multitasker. This being said, the fervor with which this festival is celebrated has not waned. In fact, it has gained popularity and momentum as an occasion to be celebrated with gusto, just as traditionally as our farming ancestors. Traditionally, a seven-day festival commencing with the Goru (cow) Bihu day wherein cows are washed and worshipped, the true Assamese leaves no stone, or should I say pitha-and-laroo unturned to celebrate this “springy” New Year fest with loads of traditional mouth-watering delicacies. Bihu geets or songs and the typical Bihu dance are performed as community functions, and groups of young boys and girls get together to celebrate throughout the Bohag month. 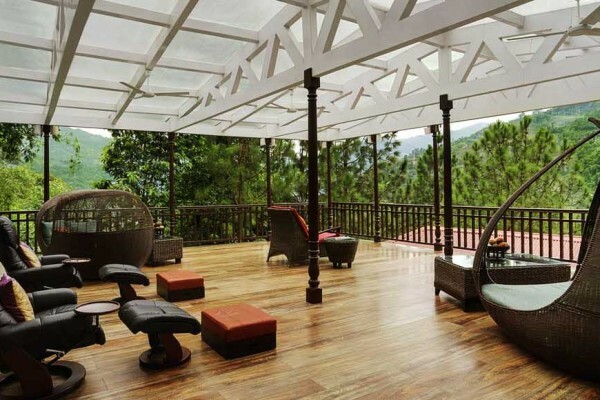 Scintillating notes and tunes from musical instruments—including dhol (drum), pepa (horn), baanhi (flute) and gogona (a comb-like instrument)—keep the state foot-tapping and hip-swaying during the month and more. Everything has a fresh feel about it, especially with the blooming of the kopouphool (Retusa flower or fox-tail orchid). The spring in the air puts a new life into the “oxomiya”, be it farmer or a city dweller, who gear up enthusiastically to face another year of life ! The Oxom Society in Doha was formed in 2008 and got officially registered in 2012. 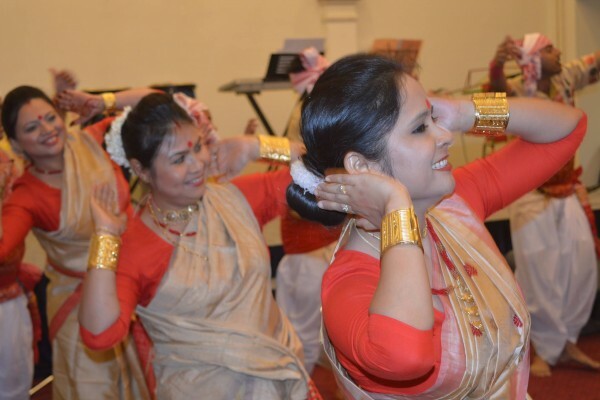 The sole intention of the community was to connect with the fellow Assamese, especially by celebrating festivals. 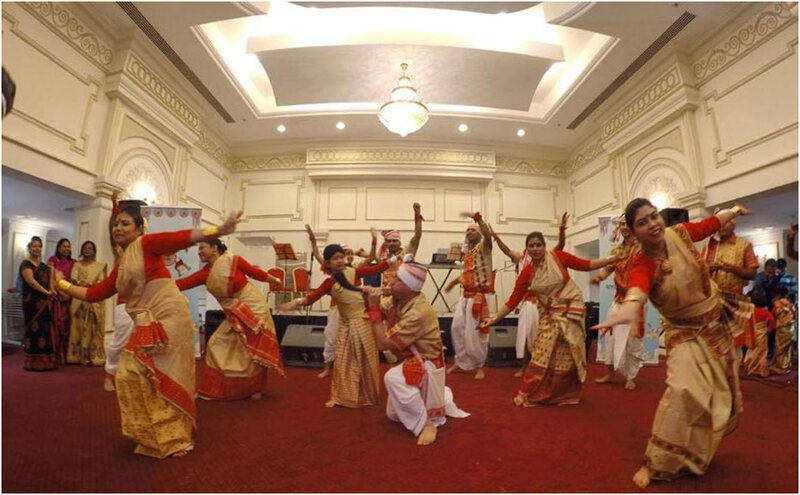 The society is run by elected members and it regularly participates in cultural functions organised in Doha, namely The Passage to India which showcases India through its many facets. 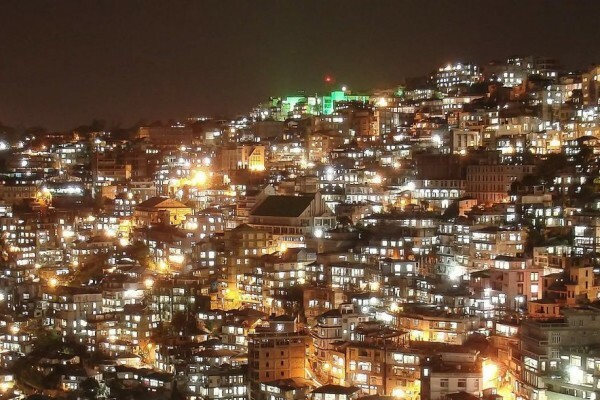 Apart from the Bihus and Uruka, Eid and Diwali are celebrated with equal gusto and enthusiasm. 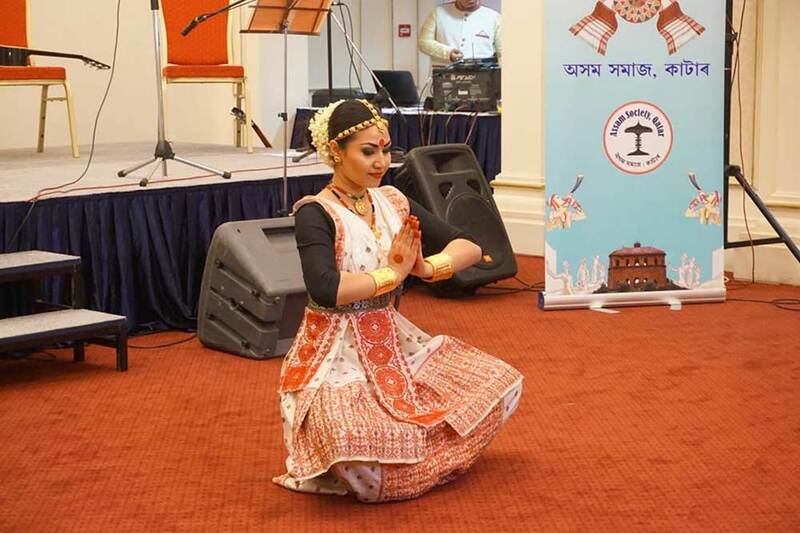 Some artistes from Assam,such as Dikshu in 2015 and Priyanka Bharali earlier this month, have been invited to Doha at the behest of the Qatar Assamese Society. The local Assamese Music group, XurOxom, helped to put together a cultural programme, which was much enjoyed by all. The Husori performed at the function got everyone out of their seats and dancing. 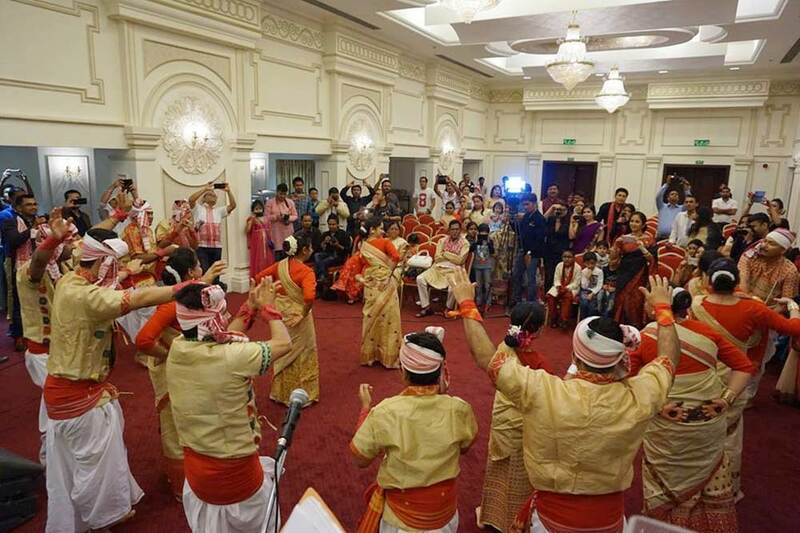 A shout out to the Oxomiya in Doha for recreating Bihu in the sands and replicating a “being-at-home” feel , far far away from the kopou, pepa, dhol, baanhi and gogona, and for creating a special feeling of unity and brotherhood amongst all the Assamese who always miss their homeland, however happy their facebook posts or pictures may be portrayed as ! 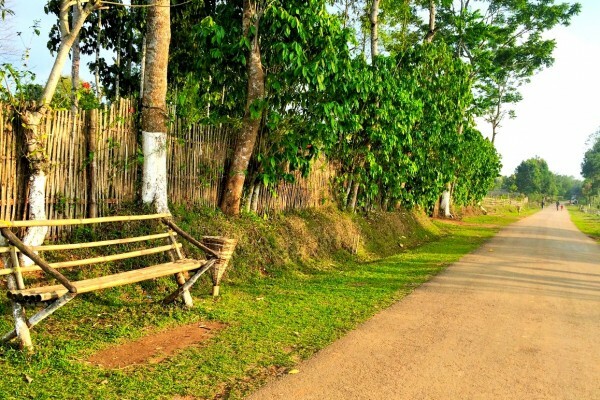 Bihu, a predominantly Assamese agricultural festival, is usually celebrated three times a year, January (Bhogali Bihu), April (Rongali Bihu) and October (Kati Bihu). Bhogali Bihu is all about feasting, marking the end of the harvest season. 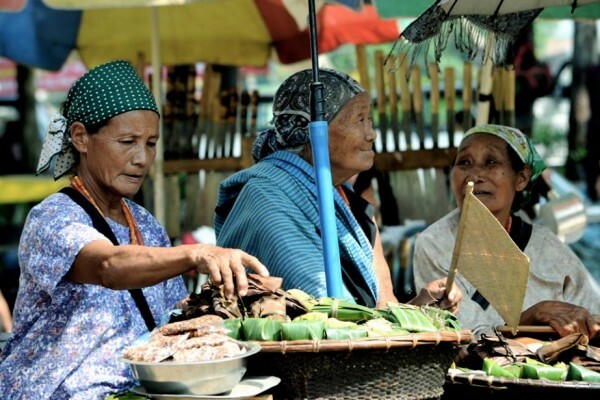 Assam is mainly a rice-producing state, and with the fresh harvest from fields, people make a number of rice-based delicacies, such as pithas and laroos, and indulge in community feasts. The Kongali or the Kati Bihu in October has a more somber feel to it, characterizing praying for the well-being of the growing paddy in the fields. People indulge in prayers and lighting bonti (lamps)under the holy Tulsi (Basil) plant, the eternal representation of light over darkness, good over evil !